Connecticut Public Television > Inside CPTV > On the Psychiatrist’s Couch with Daniel Amen, M.D. 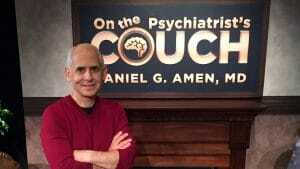 On the Psychiatrist’s Couch with Daniel Amen, M.D. He is a double-board-certified psychiatrist who has written 10 New York Times bestselling books, including the mega-bestseller Change Your Brain, Change Your Life. Now, Dr. Daniel Amen, M.D., shares with viewers the most important lessons he has taught thousands of patients over the past 35 years. He discusses ways to quell anxiety, improve relationships, and much more. On CPTV: Saturday, February 10, 2018 at 7:30 p.m.